I had so much fun making the previous frog cards that I had to use the other images from the same stamp set to make more cards! This ”So Hoppy Together” Stamp set will be available ONLY until the end of March, so if you want it, make sure to send me your order by email by March 26! I made this first card for my nephew who’s learning how to do unicycle, so it was the best image for him! He’s also a good juggler!!! This card was quite simple and fast to make. I used the Blends marker to color the frog. For this second card, I used the Balloon Celebration stamp set for the balloons and stars. The background paper is from Tropical Escape DSP. Ink: Memento Black ink, Granny Apple Green, Old Olive, Daffodil Delight, Pumpkin Pie Blendabilities markers, Smoky Slate Stampin’ marker. 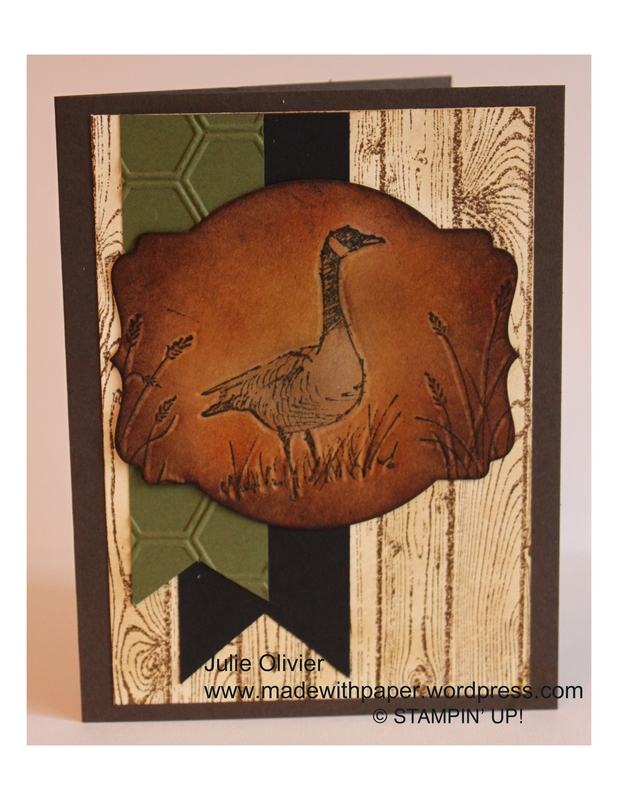 This gift card holder was made with the same stamp set as my previous card, called “Traveler“. 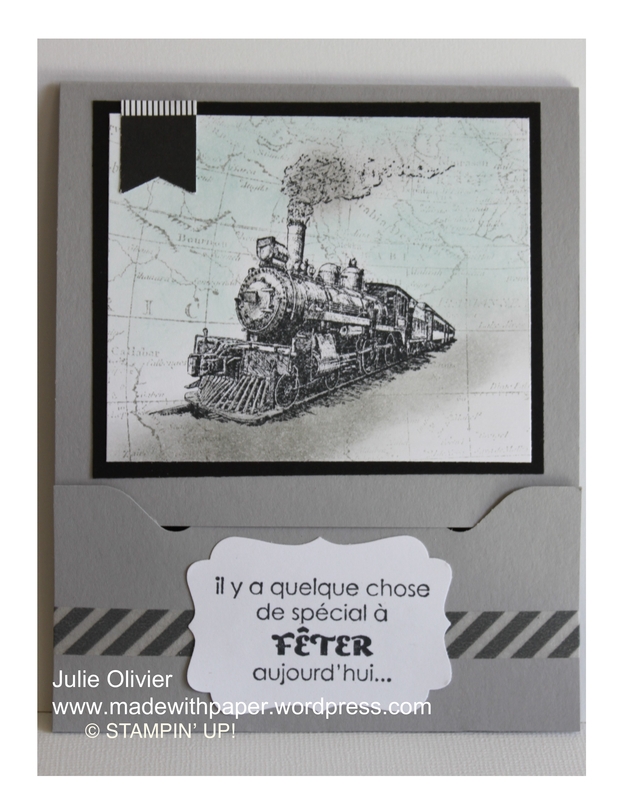 I used the train image for this one, and I stamped the World Map stamp in the background, very lightly. (Stamped on a piece of scrap paper first and then on my card.) I sponged Soft Sky blue ink and Smoky Slate ink to add a little dimension to the image. To make this gift card holder, I used the Envelop punch board and cut the 2 notches. (see below for the instructions). To secure the bottom part, I used the Epic Day Washi tape, which matched my card perfectly! I found it looks a bit like the railorad tracks, don’t you? 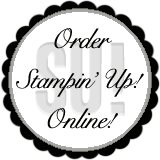 Score the 4.25” x 11” card stock at 2” and 7-1/4”. Fold toward the center. Use the Envelop Punch Board to make two notches at 1” from both sides on the 2” scored side. Wrap a strip of Washi tape across the bottom flap to hold it in place. Stick both ends at the back. Stamp the front panel. Mount on the colored card stock and glue in place. Score the Insert at 1-3/4” and 6”. 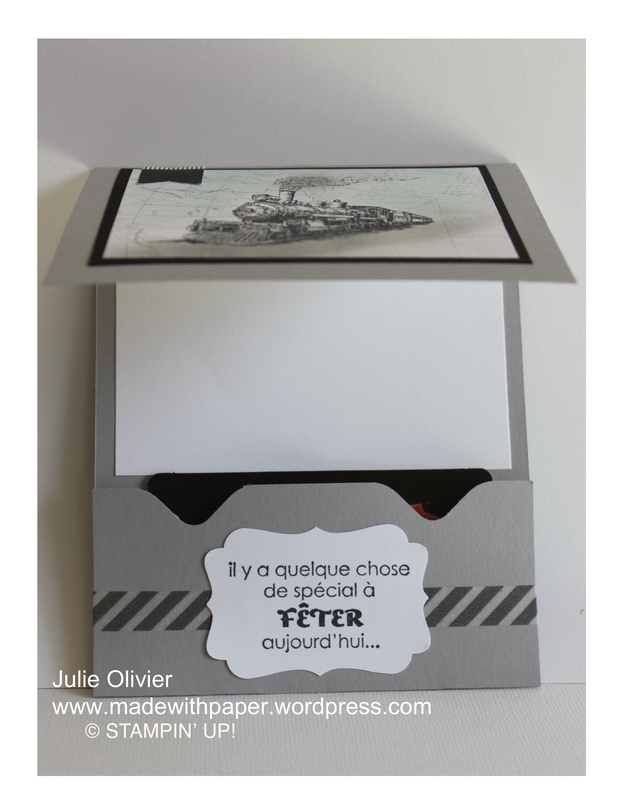 Fold the 1/2” at the top and adhere on the inside of the top part of the card. Fold the bottom part and insert in the folded flap inside of the card. 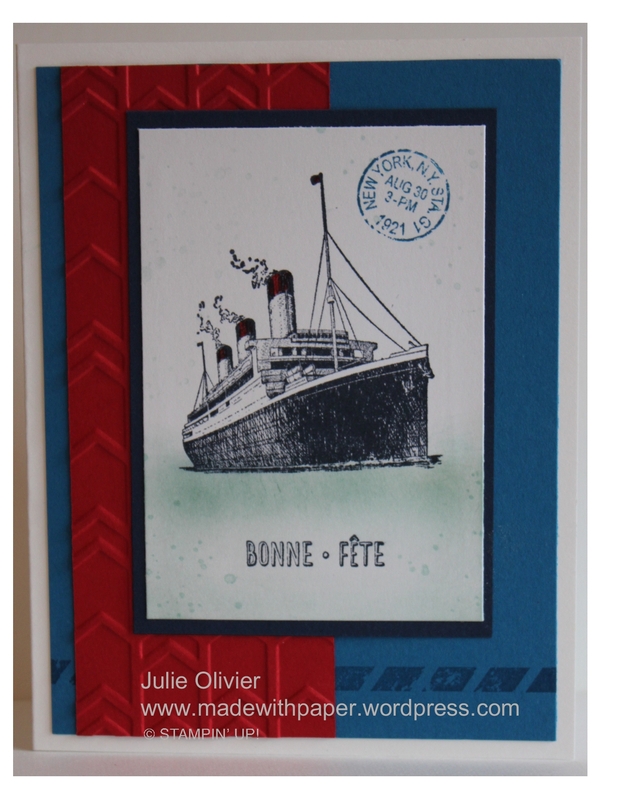 “Traveler” stamp set is a great masculine stamp set to have in your stamp collection! I made this card for my husband’s birthday. I used the “reflection” method, using the brayer. For this technique, you stamp your image on the card stock. Then re-ink your stamp, but this time, you take the brayer and you roll it on the stamp, to transfer the ink on the brayer. Then, roll the brayer on the cardstock. The image is reversed like magic! The boat was colored with the blender pen; I added some Real Red and Smoky Slate. I sponged Lost Lagoon ink for the water and Soft Sky ink for the sky. The “Moonlight” DSP stack had the perfect wave design for the background of the card! Faux Leather look makes great Masculine Cards! 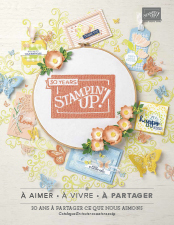 Cut the Crumb Cake card stock with the Deco Label Framelit die. Stamp your image with Black ink. Place the card stock on the Pierce mat and use the stylus to roughly trace the image. This will make like an “embossing” look of the image. Sponge Crushed Curry ink with the sponge dauber. Sponge Pumpkin Pie ink. Starting on the edges and fading in, sponge Soft Suede and Chocolate Chip ink. 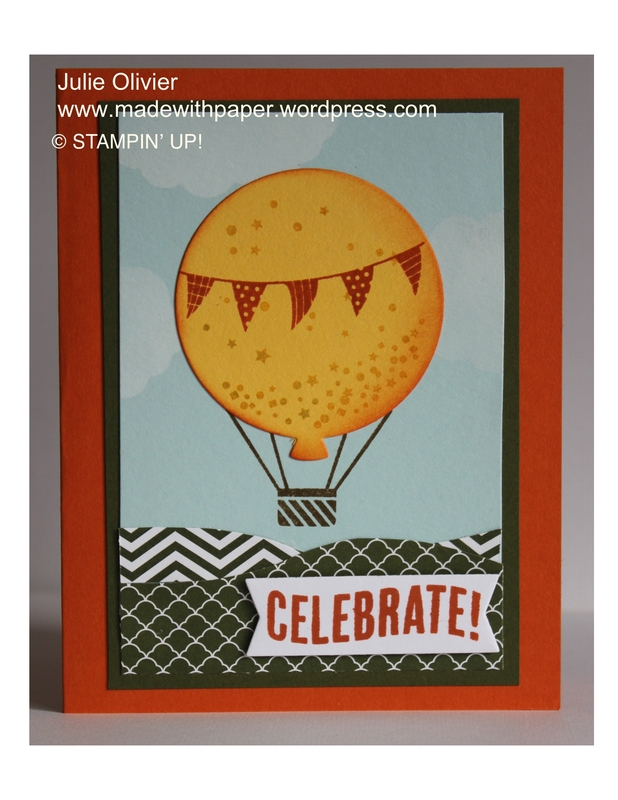 Today’s card is a cute hot air balloon made with the “Celebrate Today” stamp set. This set is perfect for Birthdays, baby, wedding, graduation, in other words, any celebration!!! Also, this set has a matching Balloon Framelits set, so it’s very easy to cut any of the parts that you need! I used 2 of the In-Color (2014-2016) Tangelo Twist, Mossy Meadow, combined with Daffodil Delight and Soft Sky. In the background, I sponged White craft ink to make the clouds. I also sponged Pumpkin Pie ink on the edges of the hot air balloon to create some dimension. I used the banner die from the Circle Card Thinlits to cut the banner. 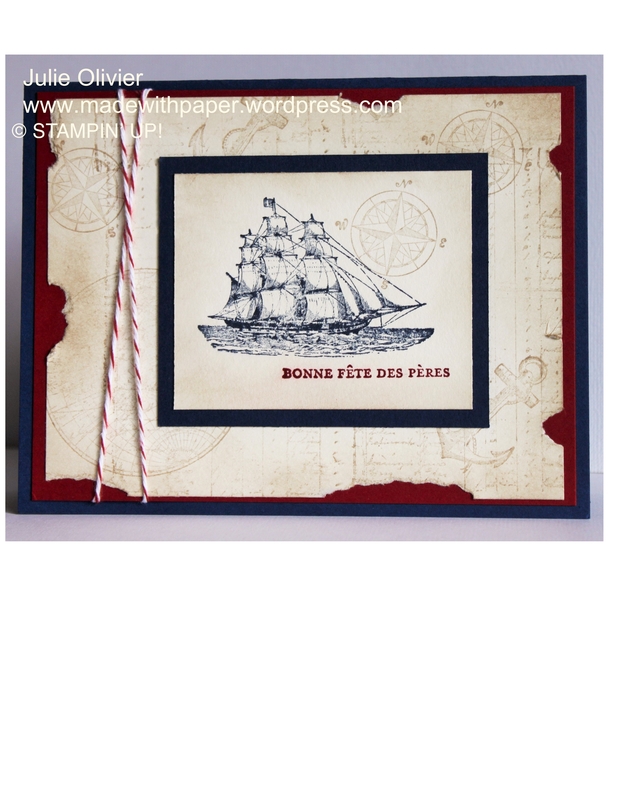 “The Open Sea” is one of the first stamp set that I bought! It’s been around for quite a while!!! But it’s such a nice and classic set, if you don’t own it, you’ll want it for sure! Over the years, I made many masculine cards with this set. Here’s one that we made at my last class. I like this old parchment look! 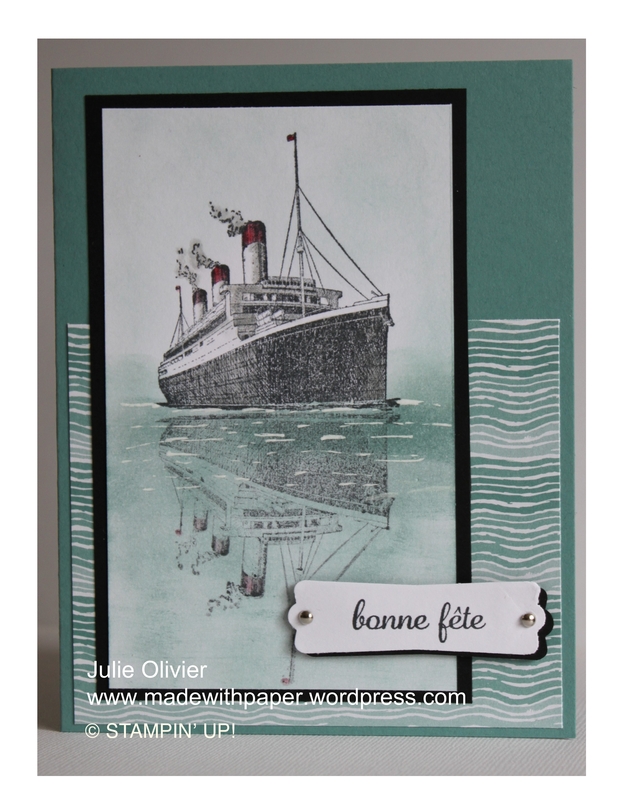 Simply use Very Vanilla cards stock, tear some bits around the edges and ink with Crumb cake. I used Cherry Cobbler, Night of Navy and Very Vanilla for the colors.